PYGA Euro Steel’s Matthys Beukes broke the South African drought while Ariane Lüthi added a historic sixth Momentum Health Attakwas Extreme, presented by Biogen, to her palmarès on a wet Saturday, the 20th of January 2018. 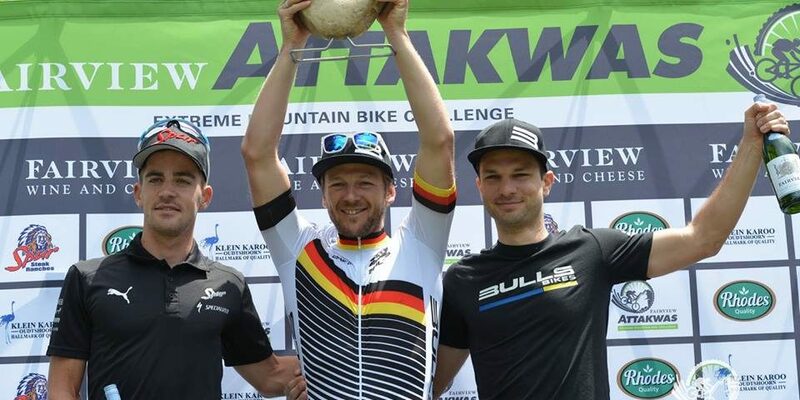 The elite men’s podium was filled by Tim Bohme and Philip Buys, and Lüthi was joined on the women’s podium by Jennie Stenerhag and Sabine Spitz. The twelfth edition of the race, best known for producing extreme heat and challenging riding conditions, was by no means an easy one – though many of the riders would have welcomed the cooler than usual conditions. The race started under clear skies at Chandelier Game Farm, outside Oudtshoorn in the Klein Karoo, but finished in unseasonal summer rains at Pine Creek Resort, in Groot Brak River. The cool conditions which prevailed in the early phases of the race, before the riders entered the Attakwaskloof Nature Reserve, allowed for fast paced racing in the elite men’s race. The PYGA Euro Steel duo were the main protagonists leading up to the King of the Mountain climb. “Matthys (Beukes) and I really pushed the pace, aiming for the course record” Philip Buys explained. “We knew if we made it hard, and increased the pace on every climb we would cause the lactic acid to build up in the other rider’s legs” Beukes elaborated. The PYGA Euro Steel riders, and Matthys Beukes in particular, set the pace from the off during the 2018 Momentum Health Attakwas Extreme, presented by Biogen. Photo by Zoon Cronje. Gert Heyns, DSV, helped Beukes and Buys with the paces making duties and eventually forced the split with Beukes as Buys was unable to match the pair as they raced for the King of the Mountain hot spot prize. Heyns was first over the summit of the Attakwas but punctured soon thereafter in a tricky section which was to affect the women’s race too. Beukes forged ahead on his own, gradually extending his lead to three minutes and forty seconds at the 85 kilometre mark and a full nine minutes by the finish. 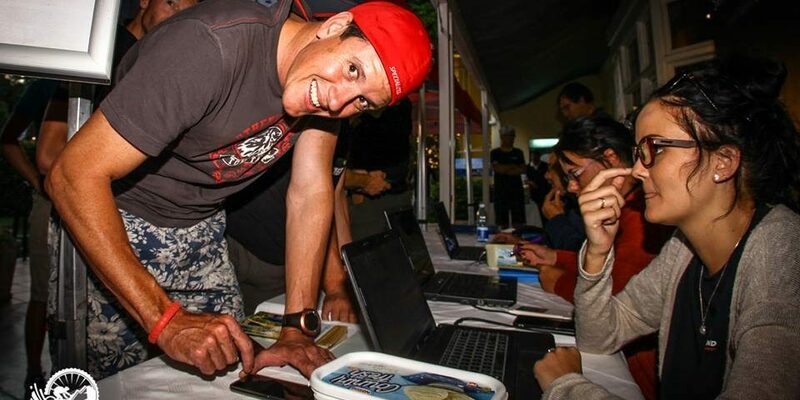 Heyns never recovered from his puncture and ended up finishing in tenth position as a series of riders, led by Buys and Bohme passed him before he was eventually handed a pump and was able to re-inflate his tyre. Buys remained in second position until the 85km mark when the Team Bulls rider, Bohme, caught him. The pair then worked together until Buys could no longer match Bohme, allowing the German to ride away to a hard fought second position. Buys completed the podium making it a first and third for PYGA Euro Steel. Gert Heyns, of DSV, raced to the King of the Mountain title at the summit of the Attakwas Pass. Photo by Zoon Cronje. The women’s race started with a tactical battle of cat and mouse between the leading contenders. A mechanical forced Carmen Buchacher out of the lead group. Reaching the first feed zone at the forty six kilometre mark Ariane Lüthi lead a group which included Robyn de Groot, Sabine Spitz, Jennie Stenerhag, Candice Lill and Yolande de Villiers. Spitz then drove the pace on the Queen of the Mountain climb and one-by-one the bunch was whittled down until only Lüthi followed Spitz’s wheel and Stenerhag, though not able to stay in touching distance kept the leaders in sight. “I used my strengths and rode the descents in the Attakwas as fast as I could,” Lüthi revealed upon being asked where the decisive move was made. With a gap established she relied on all her years of Attakwas Extreme experience to race to victory. “It was so lonely. I just time trialed all the way from water point three (at the 65 kilometre mark) to the finish” she elaborated. Stenerhag gained a confidence boost too. “I had a silly crash just rolling home after finishing my intervals last week. I hurt my arm and it bothered me all week, so I only decided to ride yesterday (Friday) morning” Stenerhag said post-race. “I did not feel that good and I struggled a bit for focus between water points three and four” she said. All things considered then Stenerhag displayed the signs of repeating her dominant form from 2017, especially when she teams up again with Esther Süss for the Momentum Health Tankwa Trek, presented by Biogen, in February. Cape Brewing Co’s Jennie Stenerhag crosses the finish line of the 2018 Momentum Health Attakwas Extreme, presented by Biogen, in second position. Photo by Zoon Cronje. Spitz recovered to finish third behind Stenerhag after she managed to reel in local favourite De Villers. Spitz and De Villiers worked together for nearly thirty kilometres before the pair entered the final descent side-by-side. De Villiers opened a slight gap with a risky ride on the treacherous, moss covered downhill, but she carried too much speed into the final corner and only just avoided a crash – but the loss of momentum handed Spitz the third position. The 2018 Momentum Health Attakwas Extreme, presented by Biogen, was certainly one for the record books. Not only was this the largest ever field of starters, but the rain which soaked the course made it the wettest Attakwas in the event’s twelve year history; and with Lüthi winning her sixth race and Beukes becoming the first South African winner since he last won the race in 2012 it live fondly in the memories of the victors in particular for many years to come. The start of the 2018 Momentum Health Attakwas Extreme, presented by Biogen, saw the race attract its largest ever field. Photo by Zoon Cronje. The 2018 Momentum Health Attakwas Extreme, presented by Biogen, women’s podium. From left to right: Yolande de Villiers (4th), Jennie Stenerhag (2nd), Ariane Lüthi (1st), Sabine Spitz (3rd) and Candice Lill (5th). Photo by Marike Cronje. For the full results from the 2018 Momentum Health Attakwas Extreme, presented by Biogen, please click here.